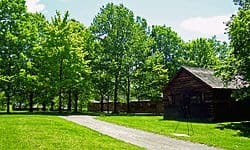 Ninety Six National Historic Site, also known as Old Ninety Six and Star Fort, is a United States National Historic Site located about 60 miles (96 kilometers) south of Greenville, South Carolina. The historic site was listed on the National Register in 1969, declared to be a National Historic Landmark in 1973, and established as a National Historic Site in 1976 to preserve the original site of Ninety Six, South Carolina, a small town established in the early 18th century. The most common proposed etymology of the toponym Ninety Six is a reference to the distance in miles between the location and the Cherokee town of Keowee. Supporters of such an etymology have to struggle with the fact that the distance between the two locales is 78 miles. David P. George, Jr., has advanced the alternative hypothesis that Ninety Six is a reinterpretation of “the nine and six,” a reference to two sets of southerly flowing streams—nine tributaries of Marion and Henley creeks and six tributaries of Thompsons Creek—in an area in which the Saluda River tends to be fed by north/easterly flowing streams. Ninety Six had become a prosperous village of about 100 settlers by the time the American Revolutionary War came knocking at the door. The first land battle of the war fought in South Carolina took place at Ninety Six in 1775; then major Andrew Williamson tried to recapture ammunition and gunpowder taken by Loyalists; outnumbered, he finally reached a truce with them. The village became a Loyalist stronghold early in the war, as was much of the backcountry settled by Scots and Scots-Irish. It was fortified by the British in 1780, as they considered this a strategic location. From May 22 – June 18, 1781, Continental Army Major General Nathanael Greene led 1,000 troops in a siege against the 550 Loyalists defending the fort in the village. The 28-day siege, the longest of the entire war, centered on an earthen star fort. Despite having more troops, Greene’s patriots did not succeed in taking the town. Ninety Six was declared a National Historic Landmark in 1973. A special ceremony was held the weekend of May 20, 2006 to commemorate the 225th anniversary of the Battle of Star Fort. Ninety Six National Historic Site is located two miles (3.2 kilometers) south of the present day town of Ninety Six on South Carolina Highway 248. 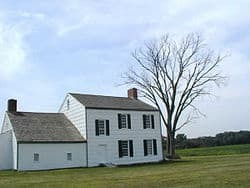 The National Park Service maintains a visitor center that includes a small museum containing artifacts found at the site, as well as other period artifacts, and oil paintings of the battle and local leaders of the American Revolution. A video about the battle is available, and there is also a gift shop. Visitors can rent a self-guided audio tour of the park. A one mile (1.6 kilometer) interpretive trail begins at the visitor center and takes visitors to the remains of Star Fort as well as the original site of Ninety Six. Additional off-road trails weaving through the woods lead to Star Fort Pond, an old unidentified cemetery (believed to be a slave cemetery from post-colonial times), and to the graves of Major James Gouedy, a trader influential in the founding of Ninety Six and Major James Mayson, who captured a significant gunpowder cache to be used by the Americans.